Stands aloft the headwaters of the Mingha River. The normal approach route leaves Goat Pass and climbs easy slopes to Lake Mavis. From Lake Mavis continue along the Main Divide to join the main North Ridge at the 1978m buttress and turn south to the summit. This ridge is heavily fortified and some handline descents may be necessary. Beware of the soft snow cornice to the east in winter. Sidle around Lake Mavis at its outflow and join the West Ridge of Mt Oates via the obvious long gully between the West Face and a prominent buttress. Much of the West Ridge can be avoided by sidling below its south side to a col near the summit. The 320 metre West Face rises directly above Lake Mavis. A line can be taken from the northern corner of the lake, diagonally to the true left, directly to the summit. Another more direct route is possible from below the summit, climbing on reasonable rock up through several exposed corners and fissures. In winter/late spring, slab and point release avalanches are commonplace across the breadth of the face. In any season watch for stonefall and general shrapnel spinning off the North Ridge. Reached either by utilising the scree/snow slopes south of the North Peak (under West Ridge), or by an exposed descent (20m abseil) via the joining ridge between the peaks. It can also be reached via the long ridge from Williams Saddle. Reached directly from the Mingha River by climbing the spur on the northern side of Kennedy Falls. From the basin above the falls, ascend the scree slide and couloir to reach the joining ridge between the summits. Climb the loose faces from here. Also Mt Williams (1718m) can also be reached from the mid Mingha River, by climbing (bashing) the steep bushy spur almost opposite the southern end of the Dudley Knob track. This route joins the Mt Williams North Ridge near a prominent buttress. 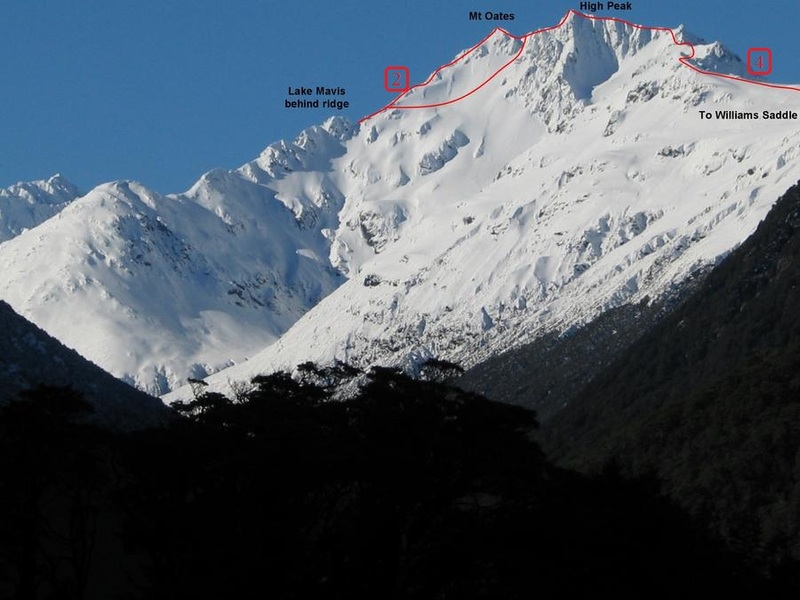 To reach Mt Oates descend to Williams Saddle then follow the easy ridge northwards, sidling under its gendarmes and outcrops on the eastern side, regain the narrow ridge, ascending it to the summit of the high peak. Reached along the ridge which leads northwards from Williams Saddle. 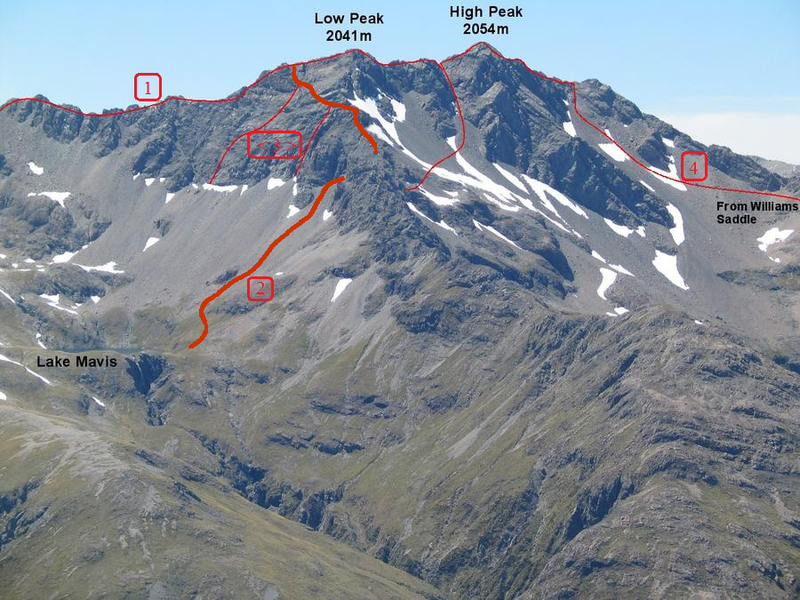 The saddle is gained by climbing the tussock/scree slope opposite Edwards Hut, aiming for the gap between the two prominent rock buttresses then sidling to the saddle. From the saddle follow the easy ridge northwards, sidling under its gendarmes and outcrops on the eastern side, regain the very narrow ridge ascending it to the summit of high peak. A more direct approach is by the stream and basin near Taruahuna Pass. Climb the spur opposite Amber Col keeping true left of the stream, then sidle northwards under MT OATES, slowly climbing towards its North Ridge above several large guts. The peak is gained easily from here via (route 8.1). This is also a good winter route to link both Edwards and Mingha Valleys via Lake Mavis.